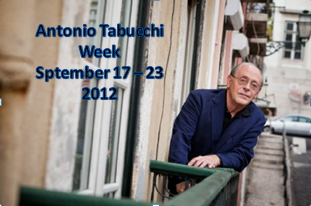 Caroline at Beauty is a Sleeping Cat is hosting an Antonio Tabucchi week. It runs from September 17-23. I apologize for not announcing my involvement earlier. But there’s still time to join. The novel I read was small and a quick read. Tabucchi is an Italian writer who loved Portugal. He taught the Portuguese language and literature at the University of Siena in Italy. Given his love of Portugal I wasn’t surprised that his novel, Pereira Maintains, takes place in Portugal. The story follows Pereira, a journalist for a small Lisbon newspaper. He’s in charge of the culture section and does not bother himself with the news. The story takes place in the summer of 1938. One day Pereira reads an article about death that intrigues him. He contacts the author of the article and asks to meet with him. The author, Monteiro Rossi, is an idealistic young man, during a time when idealism is not wanted. Actually, it could get you killed. At the time, Portugal is governed by the fascist dictator Antonio Salazar. Pereira is intrigued with the young man and offers him a job to write advanced obituaries for famous writers. Pereira maintains that these writers could die at any moment and he would like his newspaper to be on the ball. Pereira is doing his best to stay out of politics, which isn’t easy since his entire life is dictated by fascist leaders. Rossi is a leftist and his obituaries lean this way. Pereira can’t use any of Rossi’s obituaries, yet he can’t seem to let the young man go either. Is it because he and his wife never had children of their own and he now regrets that since she has passed away and he is alone? Or is it because Pereira is trying to deal with his own feelings about the fascist government? Either way, his involvement with Rossi forces Pereira to get involved and to make a statement. When I picked up this novel from the library, I was surprised by its size. I sat down last Saturday afternoon to start it. I finished it within a few hours in one sitting. Given its size I’m amazed by the complexity of the story. Love, life, politics, betrayal, and innocence are all explored. Throughout the entire story, I couldn’t quite tell who was telling the story. This mysterious narrator, kept mentioning that Pereira maintains, instead of Pereira said or believed. At first I was baffled by this. Who was this narrator and why did he keep informing me that “Pereira maintains.” As I continued reading, I realized that this technique is brilliant. The character didn’t want to get involved in politics. He wanted to stay out of the fray and to go on with his life. The use of maintains kept Pereira at a distance. This may not make sense to those who have not read it. And if you haven’t read it, I suggest you do. Very rarely do I come across novels that wow me. This is one. The writing is superb. Ever since I set it down I’ve been thinking about it. I think in a few years, I’ll revisit this novel to remember its beauty. Even if you don’t have time to read any of his works this week, I highly recommend picking up some of his stories. This book counts towards one of my reading challenges, Award Winning Books. This novel won the Premio Campiello and the Viareggio Prize in 1994. By the way, I saw that Caroline is co-hosting a German Literature Month this November. This entry was posted in Books and tagged 50 Year Project, Antonio Salazar, Antonio Tabucchie, Award Winning Books, Books, Fascism, Italian Writers, Life, Novels, Pereira Maintains, Portugal, Portuguese History, Premio Campiello, Viareggio Prize. Bookmark the permalink. I’ve read so many books in my life and still Tabucchi makes it on my Top 20 of all time. Not with this one as I have not read it yet but with Indian Nocturne. He really is an amazing writer and I’m so glad you liked and I’m lloking forward to joining as well. There has always bee a bit of a debate as to te translation of the title. An early translation was called Pereira Declares but the Italien, “sostiene” is “maintains”. Declares is too strong. I find your interpretation of the use of the title very fascinating. Three other people have read this and will hopefully review it. It will be interesting to see how they interpreted it. I was wowed by my second read by him. I liked Requiem too but The Edge of the Horizon which I will review on Saturday or tomorrow is – wow. Thanks for joining and spreading the word. That’s high praise TBM. I need to get to this book soon as well. I thought I would be able to read three but I failed. Reading two is not a failure. Wonderful review, TBM! I liked what you said about how, inspite of the complex themes that the book handles, the book is quite a fast-paced read. I also loved your interpretation of ‘Pereira maintains’. I didn’t even think of the narrator! Now after reading your review, I am asking myself who the narrator was, how did he know Pereira’s story and what happened after the last page of the story where Pereira decides to leave. I still can’t figure out who the narrator was. I think that bit of mystery helps the story. During this time, all citizens were under surveillance and not knowing who was telling the story added another creepy level to the complexity of the novel, without weighing it down with too much political talk. His simple approach was brilliant and makes it more complex, but in a beautiful and approachable way. I absolutely adored this book for the way it treated such a complex issue with such simplicity and yet managed to do it justice. The mysterious narrator also baffled me. Is it a police testimony? A writeup by someone else whom Pereira told his story? It’s very well done. Thanks for this review! I kept hoping we would find out about the narrator. I think that’s the only part of this novel that disappointed me. You read a LOT! That’s great, but I don’t know how you find time to do all the reading, work, blogging and everything else. Amazing! I´ve read that book three times and I don´t get tired of it. There´s a movie, based on that novel, starring Marcelo Mastroiani. Thank you for the review. This novel is almost perfect. I can see why you wouldn’t tire of it. Your review has piqued my interest. I just added it to my kindle. by adding it to my kindle I must admit, I told the hubby to do it…and it turns out it’s not available on kindle yet. Hopefully soon – I really want to read it now! Oh I hope so, it’s a great one. Good luck finding it! Nice review! I was also struck by the use of “maintains”, although I hadn’t thought of it as him maintaining his distance from politics – for me it seemed more as if he was being defensive, maintaining his position under questioning. So it was interesting to read your take on it. I can see the word being used as a defense mechanism as well. That’s an interesting thought. Thanks for the support and comment! you have added my curiosity on Tabuchi…Caroline had made me curious and you are adding oil to fire. I better keep my eyes open everytime I Visit a bookstore. Great review, TBM. I always like an intriquing review. Thanks for the kind words Novroz. I hope you can find this novel. It really deserves all of the high praise that I’ve read. I am sad to admit I don’t know Tabucchi, but after reading your excellent review, I don’t want to miss this book or this author. Thank you for broadening my horizons! I would list him as a must read. I hope you enjoy. I hadn’t heard of him either until I joined this challenge. He’s one of the best writers I’ve read in the last few years. I hope you enjoy.